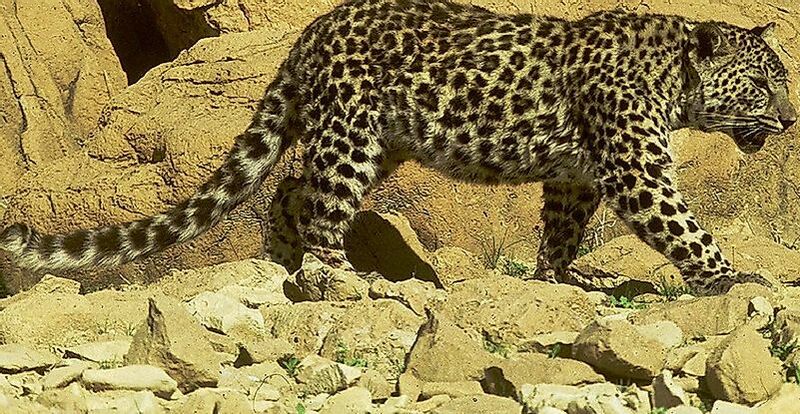 Arabian Leopards are at the top of the list of mammals on the verge of extinction in Yemen. An Arabian Leopard in the desert. Yemen is an Arab country in the southern part of the Arabian Peninsula bordering the Red sea, Oman, Saudi Arabia, and the Arabian Sea. According to the International Union for the Conservation of Nature (IUCN), threatened mammals are grouped into four depending on their risk level. Critically endangered (CN) are at extremely high risk of extinction from the wild followed by endangered (EN) which are at a high risk, the vulnerable(VU) are at a high risk of endangerment, and the nearly threatened (NT) are susceptible to becoming endangered in the near future. Among the threatened mammals of Yemen are the Arabian leopard, stripped hyena, Sind bat and the Dorcas gazelle. The Arabian leopard has a pale to deep golden yellow color on the back with black rosettes and spots against a whitish or grayish body color. The skin helps it to camouflage with the rocky terrain and the long tail for balance. Males are considerably larger and heavier than the females at 6 feet to 6 feet and 8 inches and 18 to 34 kilograms for males, as compared to lengths of 5 feet to 6 feet and weights of 18 to 23.5 kilograms for females. The Arabian leopard is found in high mountains, deep valleys with sufficient food, water and security. In Yemen, they occupy the Al Mahrah governorates. The leopard lives in solitude and only forms pairs during the mating season which is followed by a gestation period of around 100 days, cubs emerge from the den at one month and are weaned at three months. The mothers stay with the cubs for two years as they teach survival skills. The Arabian leopard preys on the Nubian ibex, rodents, Arabian gazelle, birds, insects, honey badgers, mongoose and livestock. Poaching, reduction of prey, habitat encroachment and killing by shepherds are the major threats. The nocturnal omnivore, with a broad head, pointed muzzle, and pointed ears, has vertical stripes and a bushy tail with a downward sloping back. Hunting is done in solitude and sometimes in small family groups called clans. The stripped hyena feeds on insects, small animals, fruits, and can survive for days without water. Water is taken lightly when available they can drink salty, soda or fresh water. Surplus food is stored in shallow holes dug with their snouts. The stripped hyena has no defined breeding season and the gestation period goes for 90 to 92 days with 2 to 4 cubs per birth. The cubs are born blind and deaf with white or grey coats. Weaning is done from 8 weeks to 12 months while learning survival skills from the mother. The stripped hyena has a lifespan of 24 years in captivity. The hyena is ranked as near threatened due to rapid population decrease resulting from habitat destruction, hunting and their high susceptibility to poisoning. The Sind bat is classified as vulnerable due to human disturbance of its habitats. The bat has a pale pelage, small ears, blackish limbs and ears, one upper incisor and a well-developed tail. The tail is covered with a membrane except on the tail end. The body and head length is around 42 to 52 millimeters. Sind bats have a patchy distribution in the Arabian Peninsula. Movement is by echolocation with erratic flights and dives. The bats feed on small insects and is adapted to the subterranean habitats (in caves). The Sind bat is nocturnal. The Dorcas gazelle is similar to the mountain gazelle, although smaller and with longer ears and strongly curved horns. The coat is fawn colored with a white underside. Dorcas gazelle weighs from 15 to 24 kilograms and is adapted to the desert. The gazelle feeds on leaves, flowers, pods of acacia trees, twigs and fruits, and can survive for long without water. When threatened, they run at a speed of up to 96 kilometers per hour during harsh conditions, they live in pairs and in families of one male, several females and young ones in favorable conditions. The breeding season runs from September to November with males marking their territories with dung. After six months one fully developed calf, and in rare cases twins, is born and is weaned from the first day. The calf takes solid food after around two weeks from birth. Natural predators are a major threat to the population of the Dorcas gazelle making it vulnerable. Expanding human settlement reduces the habitat ranges and creates competition for grazing land with domestic goats and sheep. The average lifespan is 24 years. The mammals of Yemen have been exposed to risks of extinction due to human activities. Nongovernmental organisations such as the Foundation for Endangered Wildlife in Yemen have been set up to raise awareness to the Yemeni people on the importance of wildlife conservation and preservation. There is also a cooperation of local wildlife bodies with other countries in the conservation of Arabian species. There are no protected areas yet for threatened mammals in Yemen. Most nongovernmental organizations also push the authorities to put up laws for wildlife protection. In addition to the above mentioned mammals, the mountain gazelle, sand cat, Nubian ibex, Arabian Oryx, Blasius’s horseshoe bat, and the long-eared free-tailed bat are also threatened with extinction.